Like many highways this summer, the AHC is also undergoing construction! We’re open during construction, so come on in! 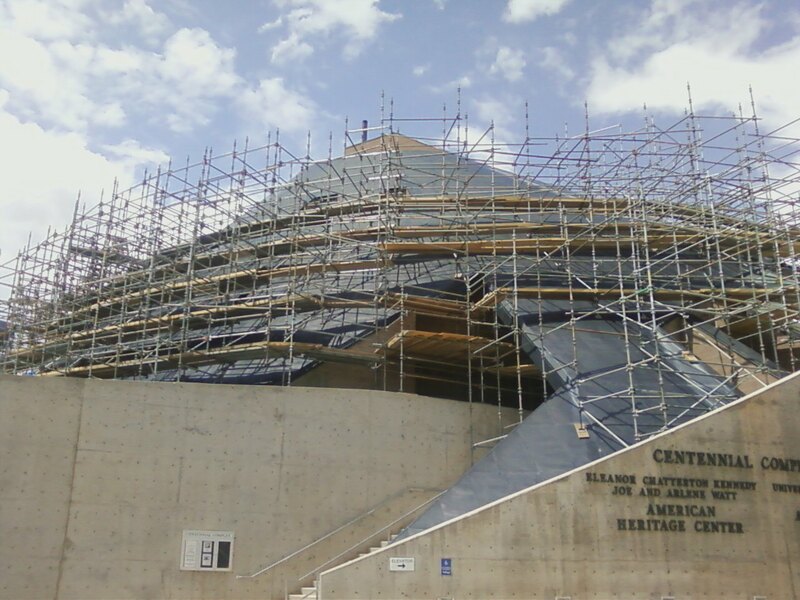 The Centennial Complex, which houses the American Heritage Center and the UW Art Museum, will be undergoing extensive renovation to its roof over the next several months. Crews began working on the structure the last week of May and this work will continue until November. While every effort will be made to avoid blocking any of the entrances to the building for extended periods, there may be occasions when one or more entrances are temporarily unavailable. Therefore, we encourage anyone planning to visit the Complex, and especially anyone with mobility challenges, to contact either the AHC Reference Department (307-766-3756) or the Art Museum’s information desk (307-766-6622) to discuss your visit and determine the best available entrance for that day. AHC storage areas will be occasionally impacted for short periods of time as well, and this may cause temporary delays in the retrieval of collection materials from the stacks. The reading room supervisor will have the most updated retrieval information for the current day. Thank you for your understanding as we undergo this renovation period!